Eastmoreland resident Patrick Cummings has found a creative way to make his voice heard a lot louder than others. One-thousand times louder, to be exact. PORTLAND, Ore. – About half of the residents of Portland’s picturesque Eastmoreland neighborhood want the neighborhood to be designated a historic district. And about half do not. Now, Eastmoreland resident Patrick Cummings has found a creative way to make his voice heard a lot louder than others. One-thousand times louder, to be exact. That’s because, in a creative attempt to keep the picturesque neighborhood from receiving a historic district designation, Cummings split the ownership of his property into 1,000 trusts. 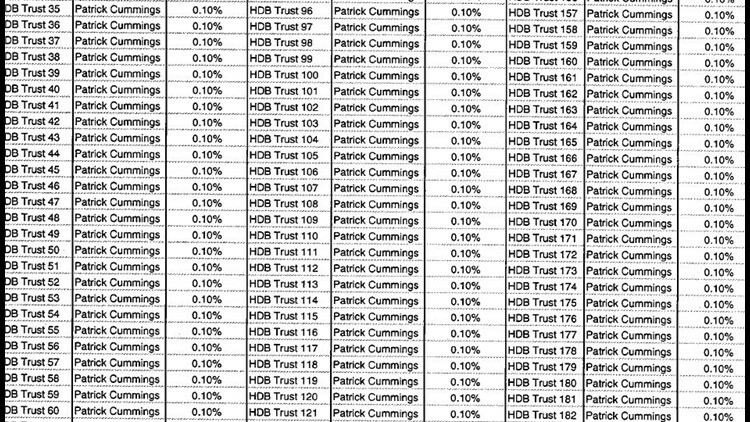 Patrick Cummings now owns one-thousand 0.1 percent shares of his home. KGW obtained the deed that shows Cummings’ shares as recorded by Multnomah County. That means that when the National Parks Service and the State Historic Preservation Office consider making Eastmoreland officially a National Historic District, Cummings could file 1,000 objections. The move not only confounds proponents of the Eastmoreland Historic District but also calls into question whether homeowners in other neighborhoods in Portland and across the country could use the same loophole to sway historic district designations. Several Eastmoreland residents have been lobbying to get the neighborhood designated a historic district for years. A historic district would preserve the character of the neighborhood’s architecturally significant homes. But it would also require some homeowners to undergo additional city review if they wanted to make changes as big as a new addition or as small as switching out front-facing windows, to make sure their homes still conform with the neighborhood standards. Cummings said he divided his home because neighbors have twice stopped the historic designation but supporters have marched on and he wants this process to end. He also objects to the National Historic District process, which assumes neighbors are in support of the historic district unless they file objections. “The net result is an unfair process that allows a very small, motivated minority of neighbors to force their will onto the rest - and thus this zombie proposal continues to haunt our neighborhood,” he told KGW. The neighbors who want a historic designation have formed an organization called HEART, or Historic Eastmoreland Achieving Results Together. The neighborhood association submitted the request to the State Historic Preservation Office, which submitted Eastmoreland for consideration as a national historic district to the National Parks Service, and neighbors are in the process of filing notarized letters of support or objection to the change. According to HEART member Beth Warner, she found out about Cummings’ trusts when she visited the Multnomah County Records Office to get the names of new Eastmoreland homeowners, to try to get them on board with the historic district. “I thought, ‘How low will they go?’ What some people will do to get their way,” she said. Anyone who owns a share of a property in Eastmoreland can file an objection, which is why Cummings’ move angers HEART members so much. Warner says at this point she’s not planning to do the same thing, but it’s not out of the question. “HEART would rather not, because we really have felt like we have kept everything above board. We would really hate to stoop to that level. On the other hand if it’s an accepted practice by the National Parks Service and the State Historic Preservation Office, we may open the door on it and consider doing it to level the playing field,” she said. Residents have until April 13 to file letters of support or objection, and the National Parks Service will begin reviewing the nomination on May 18. It will take between four to six weeks to decide, Warner said. Even then, Warner doesn't think the process will end. “We have every reason to believe we will have lawsuits and lawyers involved on both sides,” she said.